It’s official – Christmas has come to Glasgow. Twinkling lights and reindeer grazing in shop windows are grand but the Christmas markets return to Argyle Street clearly announces the festive season. And I’m loving it. Argyle is now filled with inviting huts and a mixture of alluring aromas. Bratwursts, burgers and churros smothered in Nutella call my name. My lunch break has become a glorious stroll through endless choices – curry, paella, Thai tasty treats and more. And there’s no need to stress about gifts when I can pick-up handmade delights my friends and family will adore from the stalls. One for them…one for me. Taking it all in is truly wonderful – folks bundled in coats and scarves enjoying the spectacle of it all. People watching at its best. Sigh – all is right with the world. And after work who can resist the tempting allure of a mulled wine? Or perhaps I’ll treat myself to a little cup of warm joy with a Baileys vanilla latte. If only all life’s decisions were as delicious. Brrr –it’s cold. And dipping temps only mean that other c-word looms closer. That’s right, Christmas. But let’s not be ridiculous and start the crazy countdown. Let’s ease into the festive season with another beloved c-word. Cost-free. Glasgow gets a little brighter and more beautiful on the 14 November when George Square radiates with light and fireworks ignite the night sky. It kicks off at 7pm but there’s ample entertainment in the lead up to the lights switching on. 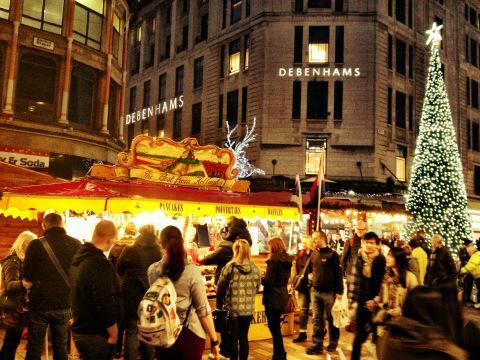 Any of you early festive shoppers will be rewarded on 17 Nov as the Style Mile transforms into a hub of eclectic entertainment from Sachiehall to Argyle Street. Magical elves, flying musicians, a samba band and more await you. Not totally free but delightful none the less, the Glasgow Christmas Continental Market returns to St Enoch Square as of 15 Nov. We’re especially excited about the many delicious delights – including our absolute favourite, Gluhwein. And you might also find the perfect pressie for that someone special – or yourself. Lace up your skates as of 23 Nov to join the daring ice-goers in George Square. 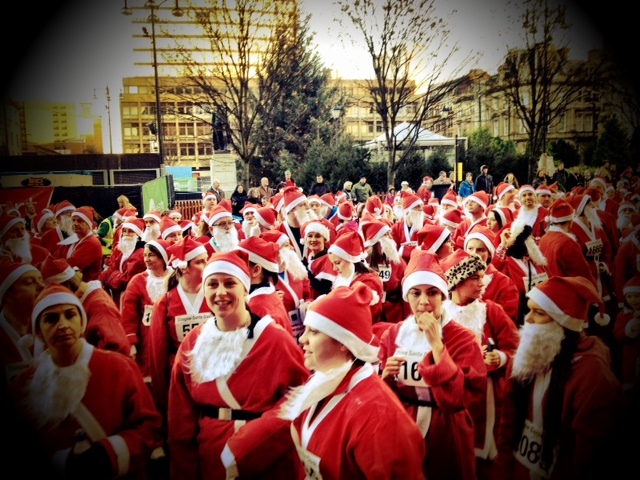 And the Santa dash on 8 December is not to be missed. An excellent event with thousands of Santas of all shapes, sizes and ages dashing their way through the city in a five km fun run. £15 entry fee includes a suit with all the trimmings. Lots to enjoy. So go on – eat, drink, shop, skate, run – and be merry. The hustle, bustle and lights of the St Enoch’s Square Christmas market always draws me in. Christmas is officially here. With my sons in tow, I set off to sort the dilemma of my mum’s Christmas present. I’m hoping the international market’s many and varied stalls will spark some inspiration. The Sunday crowds are out in force. We shuffle through clusters of people lured in by the aroma; going with the flow is the only way to survive the masses. There’s literally heaps of gorgeous food – my sons eyes pop as we explore the gastronomic tour of the world. Crepes and churros draped in nutella, sugar from France, biscuits and cakes from Italy, curry from India, chorizo and paella from Spain – we hardly know where to star t. We finally opt for Germany – enjoying a hearty Bratwurst followed by Dutch waffles. We eye up the strange green cheese then circle the stalls again – we can’t resist the Turkish delights, pistachios, rose and lemon and pomegranate. Admittedly my mum’s present has totally been forgotten. Full-up with food and contented, we’re ready to search the stalls again. The choice is endless: beautiful leather bound notebooks; detailed metal works; snuggly woollen hats tempt us but don’t feel right for mum. Jewellery, scarves and bags are all options but I admit defeat realising my shopping ambitions have been lost to the sensational smells and tastes. There’s only one solution – I’ll just have to come back again when I’m more focused. Perhaps shopping first and food later is the way to go… though I’m already dreaming of trying that paella next time round.